Aconitum are commonly known as ‘Monkshood’ or ‘Wolf’s Bane’. They are found in cool temperate zones in both Europe and North America, so are wide spread. A number of varieties are available for sale in Australia, both as seedling plants and as seeds. Useful in the cottage garden or wider garden border where they add height through the flowers as these are mostly tall upright plants. Flower stems can reach up to 1m, carrying racemes of large and blue, purple, white, yellow or pink flowers they include the common ‘monkshood’ or Aconitum napellus. An ornamental hardy perennial all Aconitum grow well in normal garden soil, and in Australia will usually require some afternoon shade. Used widely as an ornamental perennial all parts of the plant are also poisonous and need to be handled with care. Brilliant blue flowers and attractive glossy foliage. Flowers appear on long stems from 60 cm to 90cm. A. carmichaellii ‘arendsii’ is a popular cultivar. Lower growing to around 40 – 50 cm, deep blue hooded flowers. An unusual yellow flowering form. 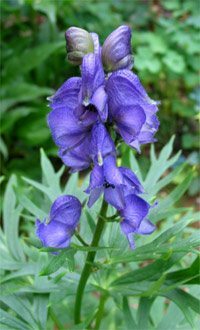 This is the ‘common monkshood’. A humus rich moist but well drained soil will provide the best growing conditions for Aconitum. In the natural environment, summers are cooler than those in Australia, so care is a little different. All varieties are best grown in morning sun and then some afternoon shade, otherwise they tend to suffer a little in our hot summers. Aconitum are best propagated by of the root division or by seed.